I'm sure the members of this supergroup (see above) didn't know at the beginning they would last so long. A streak of years from 1970 to 1978. And it all started when keyboard virtuoso Keith Emerson decided to leave his band the Nice to go solo. His name was too big to be hidden in a band. bassist Greg Lake quit King Crimson after a big debut (1969's In The Court Of The Crimson King) and drummer Carl Palmer was approached by Emerson and Lake while he was playing in Atomic Rooster. Previously, the idea included having a supergroup featuring Jimi Hendrix on guitar but the project got trunked when he died on September 1970. Had Jimi lived and agreed to join them, the band would have been called HELP. They worked hard and argued a lot about the material they would include on their self-titled debut album. 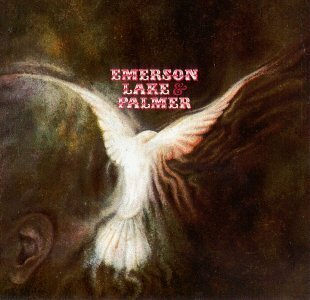 Emerson and Palmer hated a cheesy ballad written by Lake at the age of 12, "Lucky Man," but they decided to go forward and play something more appealing to the masses than to virtuoso rock adaptations of Bartok and Janacek. The three of them also realized they would produce something experimental and new, and they would disband if the project didn't work out. Something like Blind Faith did, we suppose. Of course it wasn't that way. ELP kept its momentum and popularity among Progressive Rock fans (geeks like us) all through the seventies, harvesting more fans than any previous band they were members of. Their debut album makes them burn a lot of calories: Keith Emerson tries all possible sounds with his Moog on "The Barbarian" and "Knife Edge" and proves he's a virtuoso, yet again on "The Three Fates," testing circus pipe organs, and "Take A Pebble," strumming his grand piano's strings with a pick at the opening. A breath-tak,ing performance indeed. Carl Palmer breaks snares and bends cymbals on a brutal solo on "Tank" and Greg Lake, producer of the record, proves he has a storytelling and folky heart when he switches his bass for an acoustic guitar in "Lucky Man." At the end of this tune, he finds himself not alone: Emerson allegedly taped the grandious solo on one take and Palmer provides the perfect drumming for a song otherwise plain and simple, yet beautiful. The album promised wonderful follow-ups, and they were indeed: Tarkus, Pictures at an Exhibition (1971), Trilogy (1972) and Brain Salad Surgery (1973) gave the band material for a tremendous world tour that burned their relationship down into fights, apathy and contract-ending records.